We've added email alerts for the blog! To subscribe, select menu at the upper right, subscribe, then click the confirmation link you'll get in your email. Internet is the most important as Alejandro needs it to start working on Wednesday. We called a provider, call them Company A, while we were still in the states and set up an appointment for them to install on Monday. Company A didn’t seem to have our condo complex in their system but claimed we had neighbors with their internet so it should be fine. On Monday morning we called Company A to confirm they were coming and in passing mentioned it to the complex president. She informed us they wouldn’t be able to do anything since Company A hadn’t run the last mile connections to the condo complex yet. She told us WinPR does have connections here so we called back Company A and cancelled and then called WinPR and scheduled for them to come Tuesday. It was a pretty quick turnaround time though they wouldn’t give us a window, just sometime Tuesday - we were told they would call 15 minutes before arriving. Canceling Monday’s internet appointment gave us time to go check out some car dealerships. We were going to try and go with a repossessed car from Banco Popular but their hours to view the cars are really limited and we wanted to get something before Alejandro started work on Wednesday. We decided Banco Popular would be a backup plan if the lots didn’t have anything worth buying. Neither of us have ever bought a car from a dealer before or even owned a car in over 5 years so this was going to be a new experience! We had driven past Carolina Auto Group a few times so decided to start there first. As soon as we drove in we were greeted by a friendly salesman who showed us a few things. 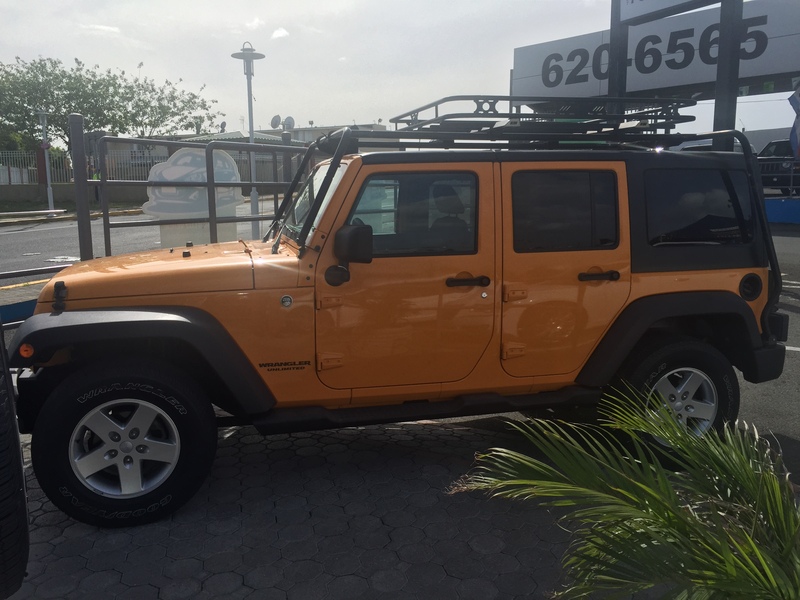 Alejandro may have fallen in love with a bright orange Jeep but it was twice what we were looking to spend so we moved on. It was so shiny and new that it was tempting but the price wasn’t. We found all the car lots, some looking more legit than others, on Av. 65 De Infanteria. We pulled into the Alberic Ford Dealership just to look around and lo and behold they had another Jeep! It was less expensive than the first one and less flashy (read, not orange). Still a bit more than we wanted to spend but we spoke with the salesman, took note of a few more cars they had, and then headed home to talk it over. We had arranged with an SSS Health Insurance agent to meet in Carolina on Tuesday morning at 10am. Turns out SSS’ offices are in the mall! I was a little surprised by this but it makes sense, you can literally get everything you need at the mall! There is even a grocery store in the same lot. We were scheduled to meet with Milagros at 10am to sign up for insurance. In already Puerto Rican style we were late! Surprisingly she was on time and called to see when we would be showing up. We had to bring proof we had just moved from CA so we wouldn’t have to wait the 90 day acceptance period you would otherwise have to wait if you already lived here and didn’t have insurance - not sure why. We brought our plane tickets and a past apartment bill and were approved by the time we left. Next on the list we decided to head back to the Ford Dealership to look at more cars. We decided to be responsible and not go with the Jeep even though we both liked it. Initially we thought we’d want an SUV so we could pick up people at the airport, haul things if we need to for the farm, and to feel a little safer driving here in PR. I noticed the dealership had a Honda Fit in the used section, the price was better, the milage low and Honda Fit’s are convertible for hauling people or things! We decided to go with the Fit! We started the paperwork with the dealership and started the test of Alejandro’s patience (its amazing how much patience he has). I know there is a bit of back and forth with the bank and the dealership when you buy a car but I feel like buying a car from a dealer in Puerto Rico using a bank in Virginia added another layer of complexity. Alejandro fielded calls from both sides about what each needed, in what format, all while translating to both parties. Its taken about a week but we should hopefully be car owners by this coming Monday! So after we decided on the Honda Fit and started the initial paperwork (which took a few hours), we decided to head to the post office to get the PO Box taken care of since we still hadn’t heard from the internet company. We’d already signed up for the PO Box online we just needed to prove our identities and get a key. Turns out the USPS Office we signed up with is ALSO at the mall! Back to the mall we went… Again we found we hadn’t eaten much during the day so we tried another Puerto Rican fast food chain, El Meson, in the mall food court. Its pretty much fast food sandwiches. Had a Medianoche, pressed sandwich with meat, cheese, and pickles - meh1. Again, will be during desperate times… On to the Post Office! The line wasn’t too long and the gentleman that helped us was very nice, he even knew where our condo was. It's a new development without an urbanization code. Complexes here have these codes so the post office can distinguish one complex from the other ones that also have an address of a certain street and kilometer number. Of course while we were at the counter at the post office the internet guys called and said they were at the apartment! So now I’m getting anxious they are going to leave before we get back! The post office had to verify our forms, make copies of the keys, check the system to confirm we’d already paid - all of which probably only took 15 minutes but it felt like eternity! We got all the PO Box business done and headed back to the condo. I kept asking Alejandro, do you think they will leave? He kept saying no so I kept my fingers crossed. He know’s better than I do about how things work here but he’s never had to get internet before either. We showed up 40 minutes after they called to tell us they were here and they still were! They were chatting with the complex president when we showed up and were totally fine with waiting. You have to be to live here… So now we have internets2! They internet guys were really friendly and apparently Alejandro helped give one of them information on how to get his son a job in the SF tech community. 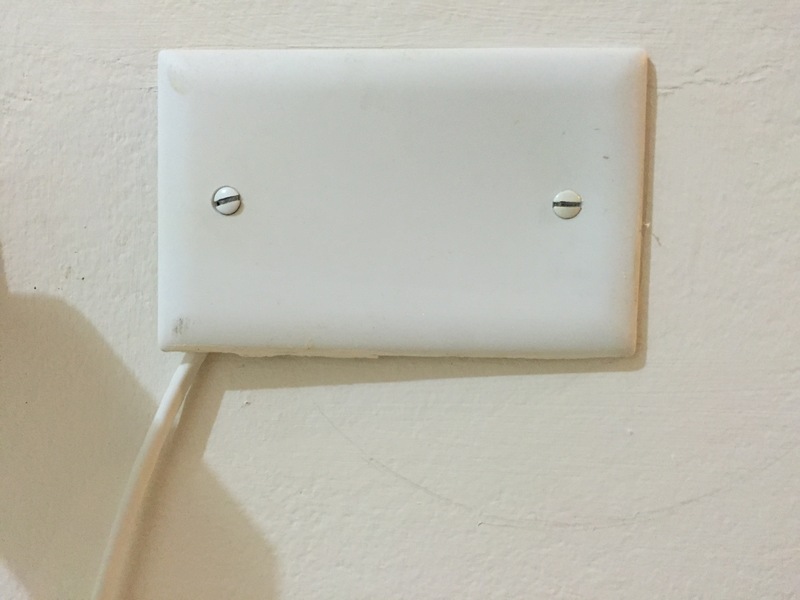 It was a funny exchange because internet guy A said “oh my son is really into technical graphic design, but he’s really lazy and probably won’t call you” Internet guy B said “you should tell his grandmother, she’ll make him call”. I guess Abuela laid down the law because he called yesterday about getting some information from Alejandro. It made me laugh and appreciate the sense of familiarity people have with each other here. So with the expectation of only getting one thing done on Tuesday, we managed to get a lot crossed off our list before work started for Alejandro. Four things in one day in Puerto Rico sounds like a win to me! A long day but a win none the less. We’ll have to remember these types of days because I’m sure we are going to have some days where nothing we try to accomplish gets done. We are so lucky to be able to have these types of days and live this lifestyle and I am beyond grateful to Alejandro for this experience. I’m also VERY VERY grateful for his Spanish. Pretty much everyone here speaks English but getting things done in Spanish is a lot easier and I think a little more comfortable for people here. I’m working on my Spanish every day, Alejandro is a patient teacher, but I think its going to take some time before I don’t feel nervous about communicating. In the short time we’ve been here I’m really in love with the place but its not somewhere you can expect to have everything run just like it did at home. If you have those expectations you’ll find it frustrating. If you can roll with the island time, accept new challenges and take in the experience you’ll fare much better!